With the return from the first four flyaway races, the teams finally can get their cars back to the factory and the development teams can start to fit the updates planed for the start of the European season. Every team planned new parts for the Spanish GP, but several decided to hold off developments through the opening races and as a result we saw two B-spec cars appear in the Barcelona pitlane. With the teams still settling down from the rule changes and the having had time to react to the diffuser debacle and the ideas other teams have come up with, we saw little actual innovation in Spain, but a lot of converging on similar ideas. There was a continuation of the evolution theme we have seen at McLaren all year. For this race the car finally sported the full double-deck diffuser. This opened up the dipped section in the middle of the diffuser and created an upper deck with it, fed from narrowing step under the car. Additionally, McLaren fitted even more flicks to the rear brake ducts to add to the downforce created at the rear of the car. The team also fitted fairings to the rear wheels for the time. Despite catching up in the design race, Barcelona, the first real challenging aero track, showed that McLaren is still struggling with aero grip. As expected, the team arrived with its B-Spec car, which was far more subtle than many had predicted. The changes centred around a weight loss programme and aerodynamics. Varying reports have circulated about how much weight was shed from the F60: the final loss in kilogram's was probably only in single figures. This loss was to counteract the weight of KERS, as less weight in the car allow more ballast to shift weight off the rear and onto the front tyres. It is also believed that Ferrari, like many KERS-equipped teams, may be running over the minimum weight limit. The laptime lost from the weight would be offset by the better weight distribution the car can achieve by making better use of the tyres. In detail, the F60B sported a revised aerodynamic package, with new front wing, sidepods, gearbox fairing and diffuser. The front wing uses a more shapely flap and more ride height to the tip of the main plane where it meets the endplate. These changes are take load of this part of the wing and use the shaping to direct airflow around the front tyre. 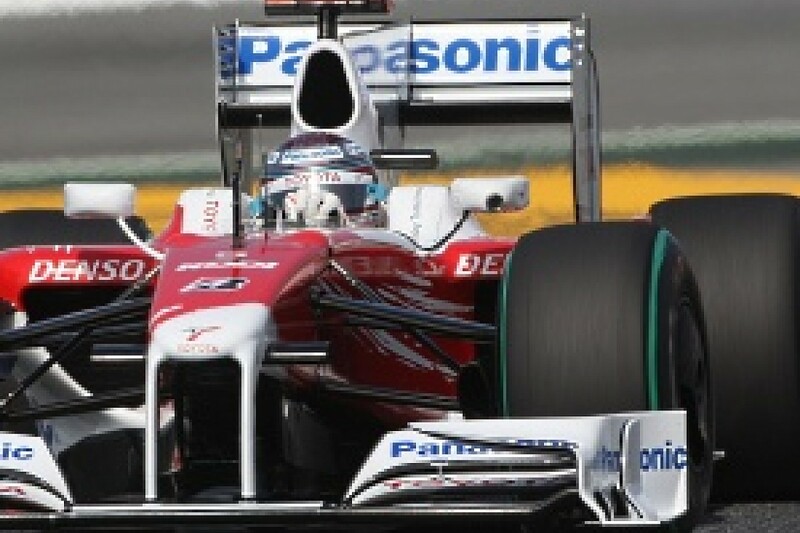 To aid this, Ferrari copied Toyota's front wing endplate ideas. The new F60's endplate sports a larger vane on the footplate and slot in the side to accelerate air around the tyre. The sidepods start from similar openings and retain the pod wings seen in Bahrain. They then follow the trend to truncate the end of the coke bottle shape early, leaving more scope of rear facing the cooling exits. The exhausts are still slash cut and exit through to the top of the engine cover. Also to aid cooling the area over the airbox on the top body was vented with two slits and a small pointed hole. Being near the car's centre-line, these are exempt from the 2009 ban on sidepod openings. Then the team has also followed the double-deck diffuser (DDD) idea, but with a less literal take on the philosophy. To make the upper deck on the diffuser, the team has had to reshape the gearbox fairing and re-sited several electronic and hydraulic systems on the side of the gearbox. Despite these changes, the first version of the its DDD creates much narrower upper deck compare the full 50cm span of the Renault, for example. The changes certainly improved the car's pace, so Ferrari's problems are now centred around strategy and reliability, which have both been strong points of the team in this millennium. Although not identified as a B-spec car, the major update to the F1.09 in Spain was certainly worthy of one. Little except the structural part of the monocoque and mechanical parts have remained the same. As with Ferrari, BMW was lacking in weight distribution and aerodynamics. The light weight gearbox and revised rear crash structure solved the first issue and a totally new aero concept has started to tackle the latter. From the front, the team has raised the nose to create more space for turning vanes to hang from under it and route more flow around the car. Thus the car now sports a cascade of vanes mounted curtain like under the nose and monocoque. Detail changes have also been made to the front wing and its endplates but follow similar principles of the Melbourne-spec parts. Then the sidepods are totally revised as is the cooling and KERS packaging mounted within. Gone are the wedge-shaped leading edge to the sidepod and the bulky full width sidepod itself. Instead, a higher inlet allows deep undercutting and space to create the complex pod wings. These are the most detailed yet seen on a 2009 car, with the vane floating on horizontal mounts in order to allow space for the bargeboards to route over the axe head protruding from the floor. The distinctive raised shoulder line is retained on the sidepods' upper surface and a conventional cooling exit\coke bottle shape is used. At this stage the team is running with a conventional diffuser, albeit slightly altered because of the revised crash structure. The original rear crash structure was mounted low on the gearbox and swept up to follow the lien of the diffuser. As this would obstruct the double-decker design, the structure is now much higher and a small void has been temporarily created between the exit of the diffuser and the tail light. While the diffuser waits for its debut, the new rear wing has been supplemented by a 15cm wide mini wing mounted above it. This sits in an area of the bodywork created to mount the rear wing and has long been exploited with small winglets below the wing. 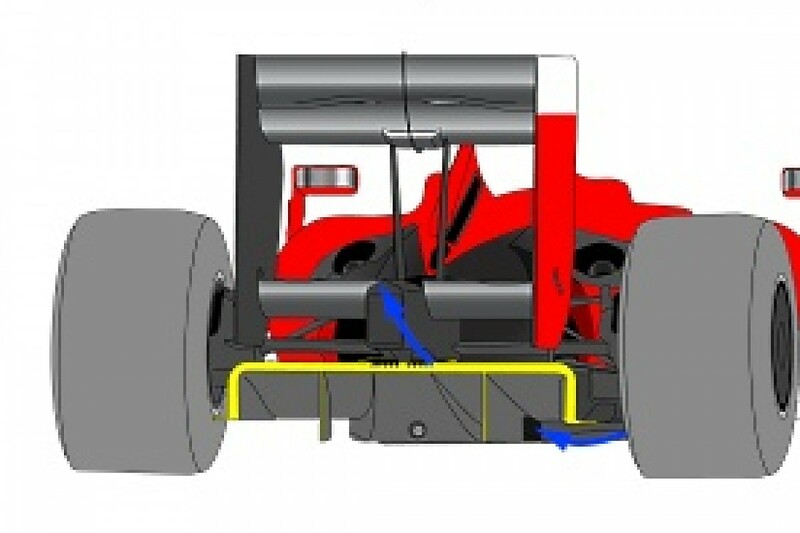 This new solution could well be copied by several teams to suit the high downforce, low efficiency demands of Monaco. With these changes BMW appears to have reversed the lull in its pace since Melbourne. Even if the new diffuser debuts in Monaco, we won't see the potential of this package until Turkey, which is the next most demanding aero track after Barcelona. Only smaller changes were brought by Toyota to Spain. These were largely centred around the front and the top body. The new front wing now uses two flaps and is allied to yet another new endplate. This new endplate features two vents in the side to aid airflow around the front tyre. Plus also a revised cascade element shape, which no longer hooks down at its tips. At the rear, the car has used a shark fin engine cover since Melbourne. However, the team has followed Red Bull and extended this to reach the rear wing. This areas needs to be unbolted before the engine cover can be removed. While the team works on its revised car to exploit the double-deck diffuser, it made the late decision to run a new front wing in Spain. The parts arrived unpainted in bare carbon fibre, making them easy to spot against the fully liveried older wings. Their design follows the principles of the launch spec wing, which takes the outer spans of the wing and merges them into the endplate and inner fence. Thus the flaps on the new version curve down to form the fence that seals the wing from the neutral middle section of the front wing. The three elements that make the wing get progressively longer in chord towards the outer tips and then merge in a single element as they near the endplate. Whereas Red Bull has been creating its own ideas on aerodynamics for the RB5 and Toro Rosso, the rear wheel fairings follow a Williams innovation and sport large vanes exits, to help extract heat from the rear brakes. As with the other double-decker teams, Williams made smaller changes to the car for Spain. The team tried outboard mirrors fitted to the pod wings. While these move the wake of the mirror away from the rear wing, they also lose the advantage that the broad turning vane-like mounts of the inboard mirrors provided. There was also a new front wing endplate, taking the out swept concept a stage further. The endplate makes a much narrower front wing at its leading edge, and then widens to direct airflow over the tyre. This idea seems to catching on with most teams who are all exploiting the idea to some extent. Like Renault, Force India introduced a cascade element to the front wing. Plus the team introduced an unusual shaping to their pod wing. 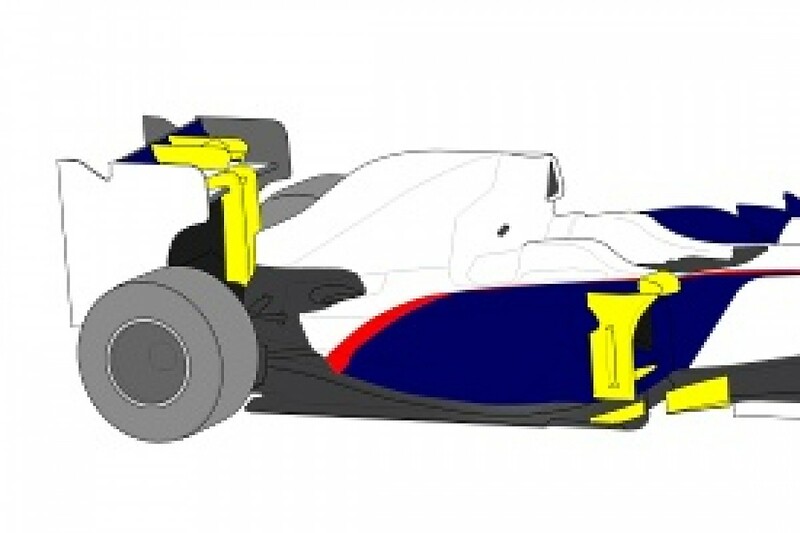 This is now merged into the sidepod, with a large closed fairing rather than as a thin plate. 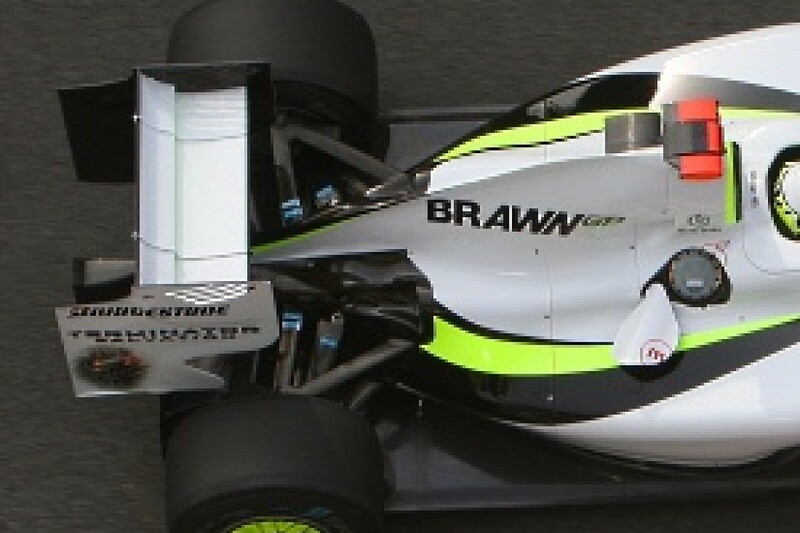 Brawn was one of the teams not to change its car over the opening races. Fortunately its pace has given it this freedom and the upgrade for Spain duly arrived as planned. Most of the changes to the car were to catch up on the design worked that had to be rushed to get the car ready for the Mercedes engine last winter. This included changes to the cooling system and gearbox, but the reported weight savings have been overplayed in the media; the car's unballasted weight is not substantially different from it's original specification. Equally, the car is visually little changed from its previous configuration. The changes to the sidepods focus on the exhaust fairing and coke bottle exit, while the upstream shape of the sidepod appears unchanged.